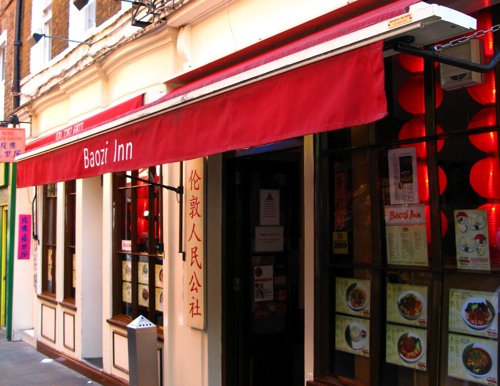 Another one of China Town’s newer breed which only opened more recently in the past couple of years, Baozi Inn’s claim to fame is its regional Sichuanese street food. A warning: for those unfamiliar with Sichuan cuisine, its a far-cry from your generic Roast Duck and Barbequed Pork rice. Like the bright red-Chilli colour of the awning outside and Mao-style lanterns hanging in its interior, one flavour tends to dominate this cuisine: it’s extremely spicy (even for my South-East Asian palate). So leave the healthy eating regime at home and be sure to bring some Kleenex to dab the sweat off the brow from the heat. 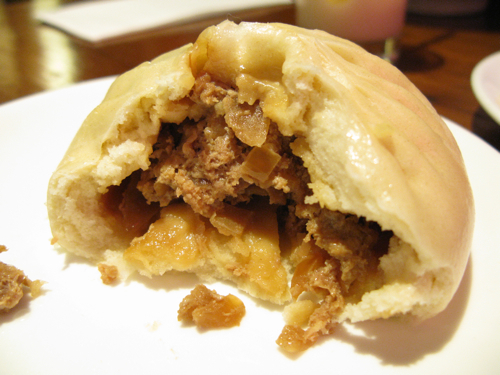 We started with an order of the namesake dish: Steamed Pork “Baozi” Buns. Baozi Inn’s version are about 2x larger than the typical ones you get in Dim Sum, so one was enough to pick at amongst the 3 of us. Nothing wrong with the mince pork and onion filling at all… juicy, tasty and wholesome. It was the bun which was the let down – much too hard and dough-y from over-steaming. 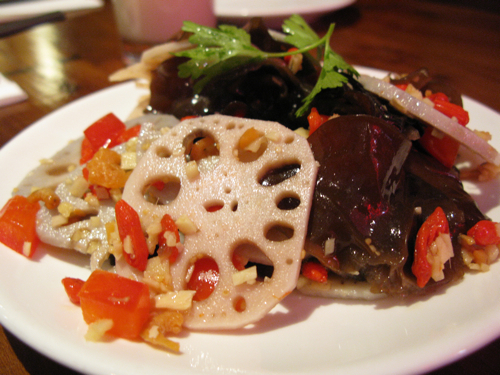 We fared better with the their Lotus root appetiser. The piquant crunch from these pickled analogue-telephone-dial-look-a-likes was a great textural contrast to the soft, elastic chew of the Black Fungus. Finished off with generous lashings of red chilli and garlic, its a great starter that preps the palate and salivary glands for the road ahead. 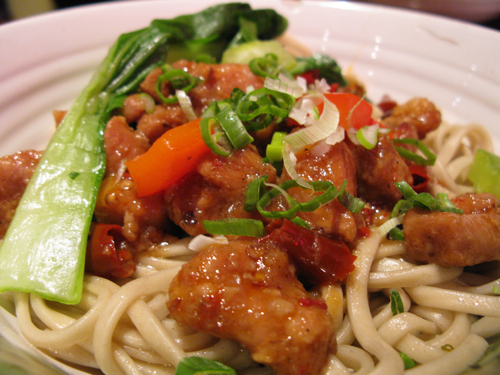 Craving something fiery enough to clear my slightly clogged up sinuses, I went for the Spicy Sichuan Pork noodles. I’m not one to shy away from spicy dishes, but this one was completely unbalanced and over the top in the chilli department. Initially, I picked at the meat and noodles at the top and refrained from mixing the dish into the the bucket of chilli oil that was swimming below to avoid death by cholesterol. Eating it this way resulted in utterly bland noodle followed by bursts of much too salty and spicy pork. Putting health concerns aside and mixing the dish thoroughly into the Chilli Oil only made things worst. My taste buds started to get numb after the first few mouthfuls, but from what I could make out, the pork was still overly salty unless eaten together with a large mouthful of noodle. The Spicy Beef Soup Noodle, though more balanced in the chilli stakes, was underseasoned and not quite beefy enough. It just didn’t go far enough in the direction of any spice, so all you really tasted after several mouthfuls was the mild heat from the chilli broth. What you will get with this dish though is a generous, whopper of a portion that’s enough for 2 to share. A disappointment and underwhelming experience on the whole. Maybe we ordered the wrong things this time around, but I felt it wasn’t quite the same place it was a year or 2 ago when it first opened – the Dan Dan Noodles and Chengdu Crescent Dumplings I had back then were by far, the more impressive options. I wouldn’t completely rule out going back, but there are other places in Chinatown where there is more choice, fewer health hazards and better tasting food for little if any extra cost. haha- blackla. Thx for spellchecking. The reason I don’t go to Baozi Inn is mostly bc the star item (the baozi) are sold really cheaply across the street by that Chinese grocery . . . have you seen them? As for the dough – from your photo, the dough looks alright. If the dough was too hard, it might be that they were just sitting around too long *after* they were cooked? I’ve walked across the shop across the street but have never tried their pork buns. Are they any good? 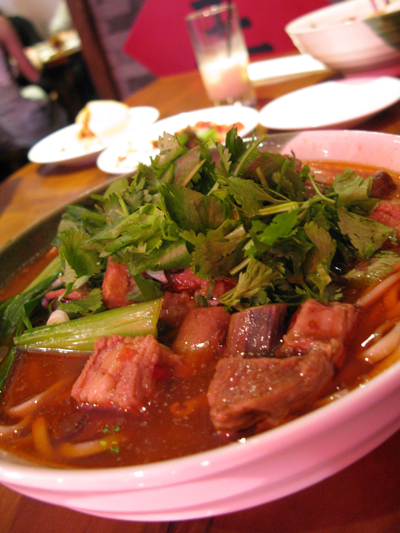 Wow, the pork noodles looks delicious! I only got to try the pork dumplings, the house special baozi and the pork baozi and this was only a snack! 🙂 Thanks for the neat review!